Hi Guys, at present time most of the person must have to use different companies Android smartphone. When you bring any latest technology Android smartphone you have lot of excitement about the features of your Android smartphone. Everybody who has Android phone want to check all the features, pre-installed apps, settings and many more. Today we will discuss about the Android accessibility features which provide better control for Android. Each Android phone has different types of accessibility feature. Most of the person not to use these feature in his Android phone. Here we will discuss about few important Android accessibility feature which you should be using on his phone. There are different Android accessibility features. There are few important Android accessibility features we will discuss in this article. These accessibility features may be unique then other Android phone. There are few accessibility features like TalkBack, Switch Access, Caption, Magnification Gestures, Large text, High contrast text, Speak passwords, Accessibility shortcut, Text-to-speech output, Touch & hold delay, Color inversion, Color Correction and many more. Here we will discuss few top accessibility features of Android phone. It is useful accessibility feature for Android lovers. Most of the Android lover use this feature in his Android phone. If you want to zoom in or zoom out your Android screen then you must turn on this feature. When this feature is turn-on you can use triple-tapping on the screen to zoom in and zoom out by single hand. During the zoom in you can do different things like – Use two or more fingers to drag across the screen, Adjust the level of zoom or spread them with the help of two or more fingers. When you triple-tap your screen will be zoom in all icons are enlarged, you can move them easily and if you want to return back in normal mode then again triple-tap on the screen. It is another useful accessibility feature for Android lovers. This feature is useful for blind and low-vision users. This feature provide the facility to describes what you touch, select and activate any app or program. When TalkBack feature is turn-on your Android device provide spoken feedback for blind and low-vision disable users. If you have any Android phone and want to change the color of background. You have choice to inversion white or black background as per your need. 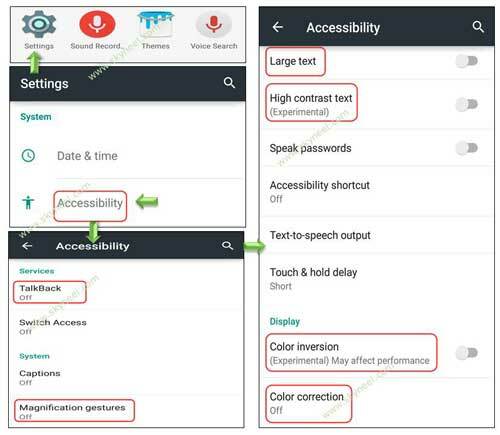 This is useful Android accessibility features and it is available in different companies smartphone. This option allows the Android users to adjust the screen and contents of colors. It is another useful accessibility feature of your Android phone. The color correction features is found in different companies Android phone. By default this feature is turn-off, but when you turn-on this feature it provide different types of correction mode which convert the colors as per your selection. Both these options are very useful Android accessibility features of your Android phone. The large text accessibility feature allows any Android lover to convert the medium text into large text. This Android accessibility features is useful for those who face the problem to choose required option or for those users who want to view enlarged text. By default this option is turn-off, when you turn this option all text automatically convert into large text. By default all text of your Android phone is shown without any contrast. Most of the person don’t like to use more contrast due to have lot of effect on the eyes. But if you need more contrast for the text in Android phone then you must have to turn-on High contrast text feature. When you turn-on this accessibility feature of Android all text shown with much better contrast. I hope you like this article. After reading this article you will be able to know about the Android accessibility features which provide better control on Android phones. These few small things keep in mind which not only improve your knowledge but also helpful for all those who need to know about the accessibility features of Android phone. Kindly share your knowledge with your friends, family members and others and give important suggestions in the comment box. Thanks to all.